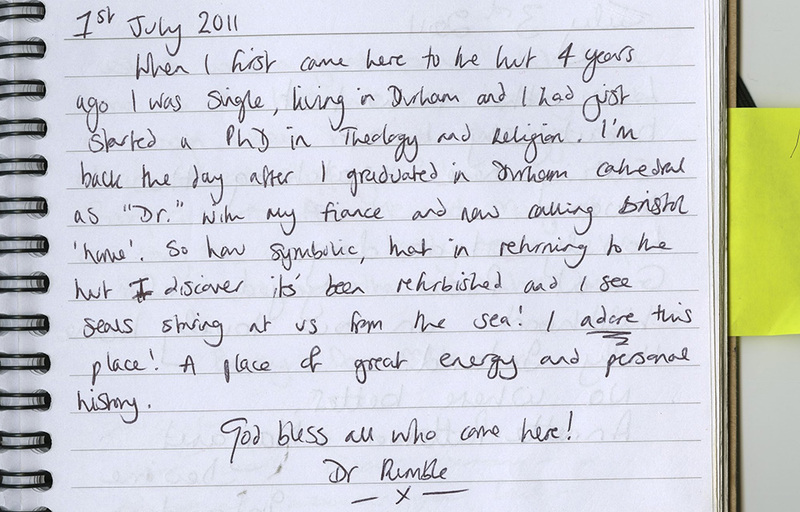 Among the most significant sources of documentation concerning Shelter are the visitors’ books. These notebooks contain drawings, stories, jokes and general comments left by visitors to the hut. Having been placed there since 2002, they give an interesting insight into the development of the site and the ways in which it has been inhabited by passersby. 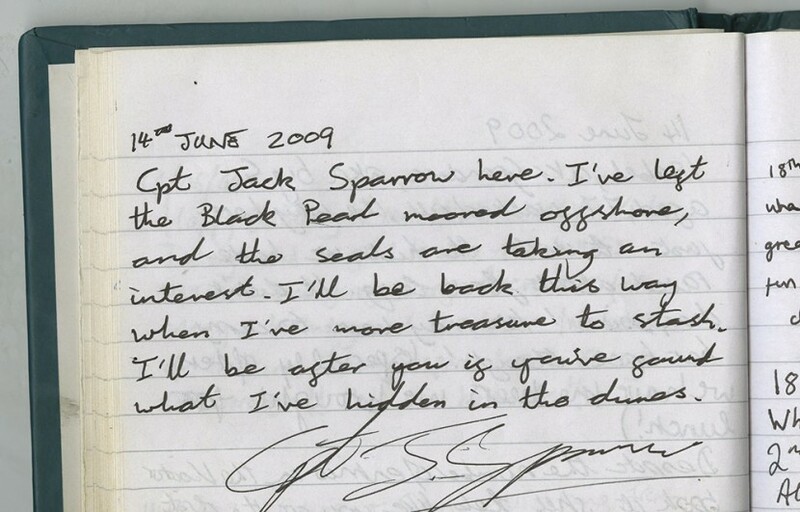 The notebooks are a complex web of texts, some cross-referencing each other, some mysterious, others with a backstory. 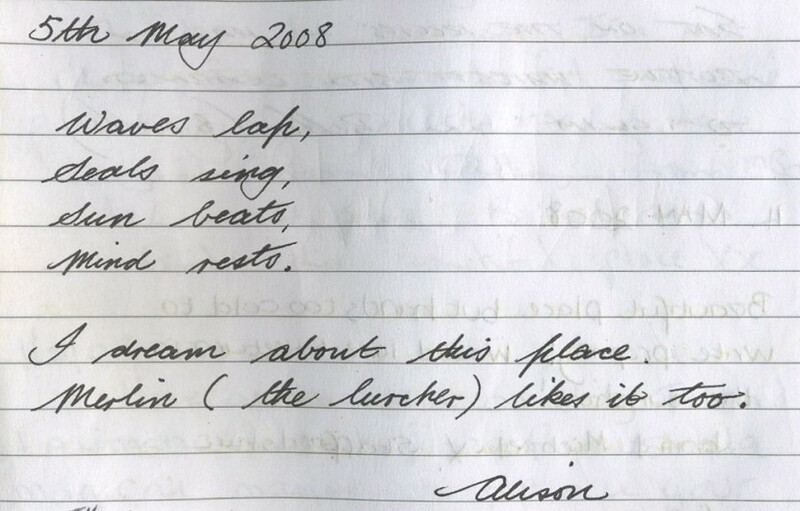 Whilst reading the books I noted the comments of those who regularly returned to the hut, many of whom wrote about how their lives had changed since their last visit and beyond. Shelter has become something of a monument for many people, and the tranquility of Holy Island seems to make it an ideal place for reflection. The simple act of leaving a notebook and pen now means that a kind of communal diary has developed. There is undeniably something interesting about reading a diary: being able to place an exact date to an event; comparing changes from one year to another; the feeling of intimacy that comes from reading something that was possibly only meant for the writer’s own eyes; the strange knowledge that each entry holds a fragment of the mindset of a particular person, at a particular present, that you now see as an object of the past. The notebooks’ initial pages are inscribed with messages prompting visitors to draw or write and to tell us where they came from. Having a record of these things allows for an absorbing analysis. The reader can trace the origins of the contributors’ journeys, when paths have crossed, how often someone has visited. The potential inherent in keeping such a record presents us with the facts and diminishes the extent to which our perception may be warped by personal viewpoints. The books were instantly engaging and very moving. There is sometimes a sense of a ‘small world’ surrounding them, and I found that many people had visited from the same small towns sometimes just days apart. 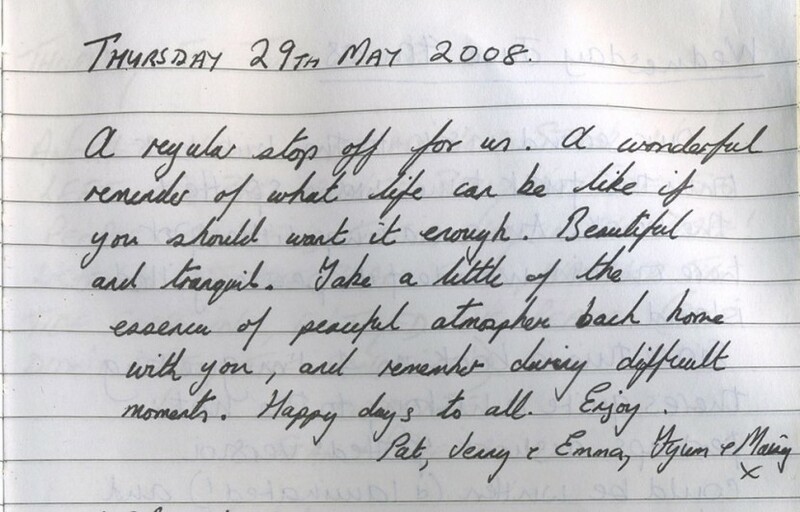 For instance, within pages of the first notebook I read posts left by two visitors from Ashby De La Zouche, a small rural town close to my own home town. I was surprised at how many visitors seemed to come from Leicestershire and its surrounding areas. I am sure that this is not coincidence and that anyone from around the United Kingdom reading these notebooks would find many things that they would not expect, but they would certainly come across something with personal resonance. Who we are addressing has a massive effect on what we choose to reveal. Anonymity allows people to address their notes to whomever they please. Some address themselves to all of the visitors to Shelter, demonstrating the sense of community that the hut has come to embody. Some leave personal notes addressed to a loved one. Some write to the landscape itself. Some write to God. Many leave their words unaddressed. Others use the opportunity offered by anonymity to confess what they would only tell to a piece of paper. Some create alter egos and many tell fictional tales. The notebooks allow for what truly is freedom of speech. Many people write of how their feelings of faith are restored, and often what is presented on the page is a reminder of the kindness of ordinary people and strangers that we may overlook in our daily lives. The posts vary from happy cheers of celebration, well-wishing, love letters, confessions, conversations and sometimes deeply emotional goodbyes. Many are very intriguing. The line between fiction and reality is blurred as people relinquish their identity, giving them the freedom to be creative without the fear of being judged. Questions may also arise, as some contributions have clearly been written to confuse or provoke. Was there really a plasma TV left in Shelter? Why do the Pooly Boys hate the hut so much? And who is Mother Duck? The medium of writing allows people to evoke a visual experience without us knowing if it ever really occurred. Whereas, whilst some posts raise questions, others offer answers. For instance, many comments accompany objects left in the hut and give some context to their original source and sentiment. Many seem to use the hut as a form of escapism. Poems are composed about the landscape which are often highly descriptive, as if the author is attempting to transport the reader to the atmosphere they felt at the time of writing. Shelter was initially presented somewhat mysteriously in that it held no bias, no apparent purpose and no clues as to its history. It is this openness that has allowed such streams of consciousness and which has resulted in the comments being so varied. No authority figure means no filter. Over the years the story of Shelter has become clearer and more accessible, but there is still an air of mystery it will always retain. The spontaneity of much of the writing is shown through highly imaginative, often humorous and sometimes baffling writing. Some of the tales have been given much thought and often go on for pages and pages. Such dedication to Shelter is shown through numerous posts, from celebratory days such as anniversaries, birthdays, New Years, even Christmas. It has also been used as a site for marriage proposals. Due to its remote location, visitors often plan a sort of pilgrimage to it, inducing group bonding. Numerous comparisons can be drawn between Shelter and various aspects of Art History. As a non-commercial and co-operative undertaking it reminds me of Relational Aesthetics, whose proponents point out that in Britain non-profit spaces are difficult to come by. Shelter is not a place for making money and lacks a clear purpose, yet it is still used and valued by the public. The lack of obvious function allows people to interact with it however they wish. The eccentricity of the objects left, the collaborative nature of the site, and the way it has become a space for artists to use and meet reminds me of Dada and Fluxus in particular. The Return to Sender exhibition, in which items taken away from the hut were circulated to and adapted by artists, is reminiscent of Mail Art where artists would send objects and art pieces around their group, changing them at each turn. Return to Sender also echoes the way some visitors react to the last post written and thus a conversation is started. The way in which the notebooks seem to solicit whatever is on the tip of the tongue reminds me of the spontaneous writing techniques used by the Surrealists which were developed to reveal the inner workings of the unconscious. The affinity that Shelter has with its natural surroundings relates to the Land Art from the 1960s onwards, and furthermore its remote setting requires the viewer to search for its location. All in all the notebooks reveal a lot more than can be applied simply to one artwork. They reveal the ways we react to our surroundings, establish communities and relate to each other, and demonstrate our inherent joy in sharing. They show how we may express ourselves in an environment without authority where communication is unfiltered. However, the notebooks represent just a fragment of the events and experiences associated with Shelter, which would amply reward further investigation.